Nature and tranquility surround the hotel: suggested to guests who love peace and want a modern, comfortable hotel, with touches of contemporary design. Ideal to explore the beauty of the Val di Noto. Cambiocavallo Unesco Area Resort is located in Modica, a charming picturesque town in the Val di Noto. Ensconced in a lush Arabian-Mediterranean garden, in the midst of the peaceful countryside of Ibla, in a territory dotted with historical, architectural, archaeological and environmental heritage, Cambiocavallo Resort has a splendid location just 4 km from a crystal-clear sea and approximately 1.30 h from Malta. 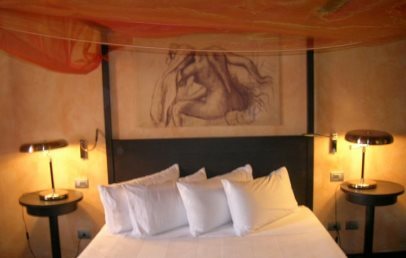 The boutique hotel of charm Cambiocavallo Unesco Area Resort is a carefully refurbished old “posada”, that is an ancient country inn where travellers on horseback or horse-drawn carriages used to stop - hence the name which means 'changing horses'. The refurbishment has preserved all the original features: cane and chestnut beam ceiling, walls of exposed natural stone alternating with warm-tinted plaster finish. The fascinating elements of the ancient structure are coupled with a contemporary, simple and minimalist design plus all the comforts of a modern hotel. Cambiocavallo Unesco Area Resort has eight rooms, a restaurant and a large swimming pool with solarium area. Quiet and light-filled, the Resort's eight rooms have air conditioning, LCD TV, complimentary Wi-Fi connection and minibar. Deluxe (20 sqm) – ground floor; en-suite bathroom with shower or bathtub, veranda with view over the swimming pool or the countryside. Deluxe Suite (45 sqm) – room with canopied double bed, lounge area and entrance hall with two twin beds. Bathroom with hydro-massage bathtub and window with countryside/garden view. Superior Terrace Suite (50 sqm) – room with canopied double bed, lounge area and entrance hall with two twin beds. Bathroom with hydro-massage bathtub and private terrace with view over the countryside and view of the sea. On the Pozzallo Beach, awarded the Blue Flag and located only 4 km from the Resort, the guests can rent at a special reduced rate from one of the Lidos 2 sun beds and 1 beach umbrella in an excellent position. In addition to the rich buffet breakfast, guests of the Resort can savour the traditional Mediterranean cuisine offered by the Restaurant. Open in the evenings only and by reservation, it offers three set menus (meat and fish) varying according to the produce in season. Again on request, the Restaurant provides gluten-free, vegetarian or other special menus. The guests have at their disposal the swimming pool, free Wi-Fi and the indoor and outdoor common areas. The Resort has off-street parking and on request provides several massages, Ayurvedic massages (reservation necessary) and treatments. Tourist tax – The municipality of Modica charges a tourist tax of € 1.50 per day per person to be paid at the Hotel. The tax does not apply to guests under 18 or 65 and older. 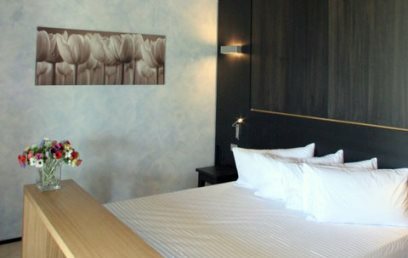 The Deluxe rooms are located on the ground floor. 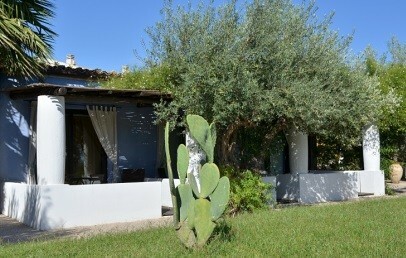 They have a traditional Sicilian reed ceiling, and have modern, simple and minimalist designer furniture. The en-suite bathroom has shower or bathtub, hair-dryer, make-up mirror and complimentary toiletries. 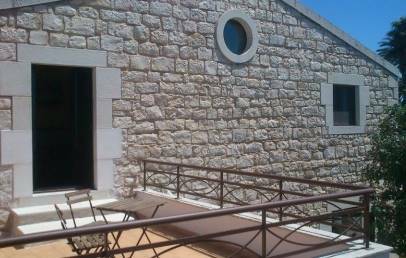 The Deluxe rooms have a veranda with a view over the swimming pool or the countryside. The Deluxe Suite has a traditional Sicilian reed ceiling and modern, simple and minimalist furniture. It comprises a spacious double room and a lounge area, plus two single beds in the entrance hall. The en-suite bathroom has a hydro-massage bathtub, hair-dryer, make-up mirror, bathrobes, slippers and complimentary toiletries. From the windows of the Deluxe Suite you can enjoy a relaxing view over the countryside and the garden. The Superior Terrace Suite has a traditional Sicilian reed ceiling and modern, simple and minimalist furniture. It comprises a spacious double room plus two single beds in the entrance hall. The en-suite bathroom has a hydro-massage bathtub, hair-dryer, make-up mirror, bathrobes, slippers and complimentary toiletries. The Superior Terrace Suite also has a private terrace with relaxation corner offering a view of the countryside with the sea in the distance. 10% reduction! Not refundable rate; prepayment required upon confirmation. Only for Charming's clients: sicilian aperitif upon arrival!